If you have any love of history at all, you’ve got to love this picture. 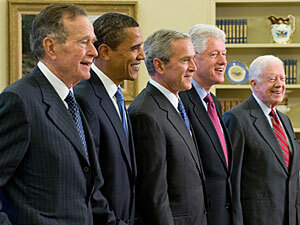 Has there ever been a time when six presidents were alive? We’re researching — as time allows — but so far we can’t find that there has. As far as we can tell, if there have been, there are no pictures of them together. It would have been nice if they’d lined up according to their service. If you’d been invited to lunch today, what question would you ask? update 4:55 p.m. – Six presidents were alive at the same time only once: 1992-1994 (Nixon, Ford, Carter, Reagan, Bush, Clinton). I don’t recognize it. It appears to have wings, and he was a World War II aviator (trained at South St. Paul, you know), so perhaps it is related. Anyone? ‹ Older What’s love got to do with it? can you line up according to your service? Nixon, Ford, Carter, Reagan, Bush, Clinton. In their very drab suits, white shirts and ho-hum ties, they look almost clone-ish (not to be confused with clownish). Where’s the facial hair, earrings and tatts, I ask you? I think it’s time we had a suitless prez. That’s funny, when i first looked at the picture (and before i read what you’d written, i thought “i wish they’d line up chronologically). How long until Obama goes white? We’ve seen it happen to president after president, i realize it has to do with their age but you’d think it has something to do with the stress of the job. If you were going to take office on Jan 20, what would be the number one thing on your agenda? What do you perceive to be the biggest hindrances from getting your agenda through the upcoming legislature? I can see the Bushes and Obama are wearing lapel pins. Can anyone see what they are? Flags? They weren’t in the White House, but there’s a photograph of 6 ex-presidents at the opening of the Ronald Reagan Presidential Library in California in the early ’90s. Nixon wasn’t dead yet and he, Ford, Carter, Reagan, Bush and Clinton were all photographed in the front of the library. I remember this b/c I bought a postcard of this photo when I visited the Reagan Library a few years back. It’s a very impressive photo. Don’t know what this says about how my mind works. First thing I thought was: Why are all the Democratic Presidents (excluding the one who isn’t president yet) wearing RED TIES and all the Republican Presidents wearing BLUE TIES? I thought (according to the media) the team colors are Republicans red, Democrats blue. //Where’s the facial hair, earrings and tatts, I ask you? In every shot of seen of these few minutes, Carter looks quite separate from the other four. Is it me or is it weird body language? Isn’t Bush Senior known for jumping out of airplanes on his birthday. Maybe he made a number of jumps and now he is a certified parachute jumper. I think it has to do with Jimmy’s homies. None of them are in the photo. Jimmy was a 70’s dude with Nixon and Ford and on the other side of Jimmy’s run was Reagan. I think the body language has to do with the Reagan gap between him and the Bushes.